This is the classic tall, wide leaved rush with the brown 'flower' that looks like a bell-pull. Often shown in paintings as a small elegant clump in the corner of a pond, this rush can completely take over a small pond in a few years, unless you keep pulling it out where you don't want it to grow. However, it doesn't like to grow in water deeper than 2.5 feet, so that is another way to control it in a large pond or lake. And it is very beautiful! The rhizomes can be consumed after cooking and removing the skin, while the peeled stems and leaf bases can be eaten raw or cooked. It is not advisable to eat specimens deriving from polluted water as it absorbs pollutants. Do not eat them if they taste very bitter or spicy. The disintegrating heads are used by some birds to line their nests. The downy material can be used as tinder for starting fires. Dragonflies seem to like breeding in ponds with this plant present. 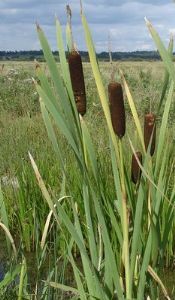 Typha can be dipped in wax or fat and then lit as a candle, the stem serving as a wick. It can also be lit without the use of wax or fat, and it will smolder slowly, somewhat like incense, and may repel insects.